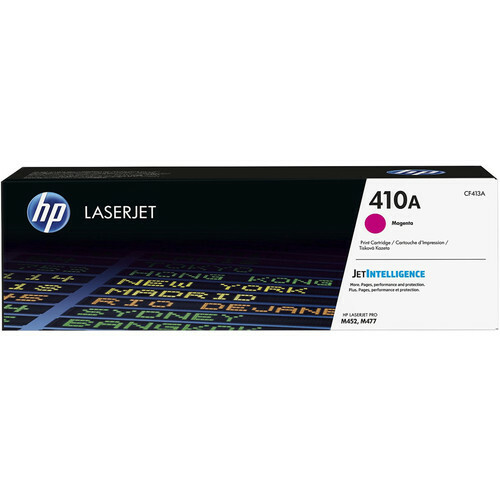 Keep on printing with your LaserJet M452 or M477 series unit with this 410A Magenta LaserJet Toner Cartridge from HP. This cartridge offers a yield of approximately 2,300 pages. 410A Magenta LaserJet Toner Cartridge is rated 5.0 out of 5 by 4. Rated 5 out of 5 by MrJamtastic from Best Product! I have always used genuine HP toner in all my HP printers. Always the best quality printing. Never any problems. The best of the best! Rated 5 out of 5 by JTether from Great Printer and Cartridges.... Our office bought this a couple months ago for some large printing projects and we love it! Fast, pretty quiet and very clear! Rated 5 out of 5 by mhansen2 from Excellent results. A bit pricey, but with my HP Laserjet M452 I get over 500 prints per cartridge and the color rendition is excellent.